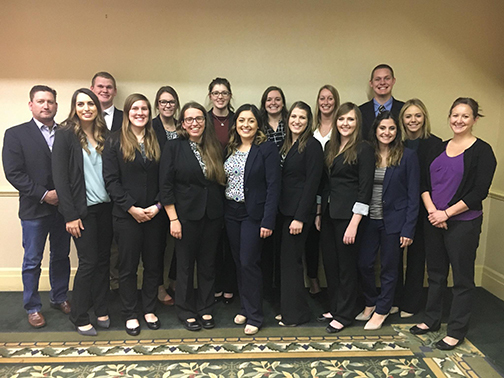 Cal Poly dairy science students were among the top contenders at the recent Western Regional Dairy Challenge Competition in Twin Falls, Idaho. Fifteen students from the upper-level Dairy Farm Consultation course traveled to the University of Idaho from Feb. 23-25 to compete in the challenge, coached by Animal Science professors Rich Silacci, Julie Huzzey and David Vagnoni. Participants, working on five-person teams with students from other universities, assessed all aspects of a working dairy farm, including facilities, nutrition, financials, reproduction and animal health. Students from Utah, Idaho, Washington and Alberta, Canada, also competed. Three Cal Poly senior dairy science majors received first place: Frankie Gambonini of Petaluma, Camryn Spencer of Arroyo Grande, and Marilyn Van Beek of San Luis Obispo. Six students received second place: senior agricultural science major Miranda McCurry of Elk Grove, and senior dairy science majors Tracy Nelson of Glendora, Emily Butner of San Marcos, Elizabeth Russell of Stanwood, Washington; Katie Migliazzo of Atwater; and Emma Sills of Tulare. A Cal Poly team will travel to the 2017 National Dairy Challenge Competition in Visalia, California, from March 30 to April 1 to represent the university in the national contest. At the national competition, each college will have a four-person team compete head-to-head. It is anticipated that 32 colleges from across the nation will compete. Cal Poly students Gambonini, Migliazzo, Van Beek and senior dairy science major Bryson Wind of Bakersfield will represent the university. The Cal Poly team that attended the Western Regional Dairy Challenge in Twin Falls, Idaho. Pictured from left to right in the front row: Emma Sills, Marlena Wagner, Elizabeth Russell, Alanna Smith, Katie Migliazzo, Frankie Gambonini, Annalicia Luis, Miranda McCurry and Professor Julie Huzzey. In the back row, from left to right: Professor Rich Silacci, Jay TeVelde, Darby Toth, Emily Butner, Tracy Nelson, Marilyn Van Beek, and Bryson Wind.